Welcome to this fun, joy-filled course all about putting those beautiful crystal babies to work in your life! Crystals are incredible storers and transmitters of information, and in this course, you'll learn easy, practical steps to utilizing them on crystal grids with love and intention for the highest good (plus some other fun bonus content!). And what's even better is that you don't have to be a sage mystic to access that power! You, sitting right there in your pajamas, are spiritual enough to put these babies to work in real, potent ways in your life. Everything you need to know to get started is contained in this kit: 1) the supply list including printable grids, 2) our favorite online resources for crystals and more, and 3) the step-by-step basics to get you gridding today. We even recorded a fun, real-life girlfriend's guide to getting started. Which is basically a video of us talking woo, laughing, building an easy-peasy grid and doing our sister thing as if you're right there with us. So welcome! 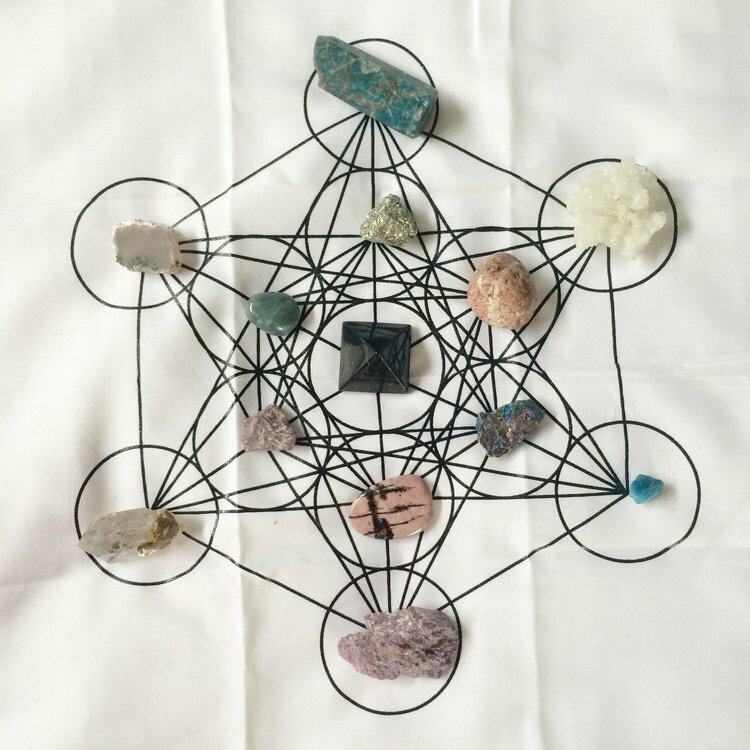 We hope you enjoy this introduction to creating intention-based crystal grids and that it opens up whole new worlds of fun and intention-setting. May it bring you closer to your crystals and to yourself. This entire Universe is based in order. The foundation of every living thing repeats the same shapes and patterns known as "sacred geometry". Each sacred shape contains the codes and clues to all the unanswerable questions of mankind, and their very existence promises a greater understanding of the nature of this magical, mystical life. When we place crystals (the oldest beings on the planet) mindfully and purposefully atop these shapes we call in a greater energy to assist and inform us. The act of gridding is itself a type of sacred prayer and a way to connect with this exquisite world of which we are a part. And in the same spirit of the old adage "two heads are better than one," the combined energy of the crystals results in a multiplier effect. By forming a shape with the stones, you create a current of energy directed at a single intention. And when that energy begins to flow, magic ensues. We belive in this practice not only because it feels holy and honoring but because it is light, easy and fun. And if there's anything we call for in our own lives on a daily basis, it is the infusion of more fun. We'll go into the step-by-step process of building your grid in the next section, but for now, read through this supply list and gather the tools you'll need to build your own crystal grid. Grids are sacred geometrical shapes printed out either on paper or cloth. The shapes themselves are believed to have mystical powers because they are the repeated building blocks of all living things and are clues to the divine order of the Universe. Remember to let this entire process be easy, and that begins with your grid! From a computer you can simply save the following images to your own desktop (drag and drop to your desktop or right click and save) and print them out for an instant grid. If you don't have a printer, you can upload the image online to your local printer (like Office Depot), and they'll print it for you for a small charge. We often do this and have ours printed on 100lb white cardstock for durability. You'll want a center stone to hold your intention and a handful of surrounding stones to help support and amplify the energy of your grid. In the video we suggest having 12 supporting stones in two circles of 6, but you can use as many or as few as you like. For your center intention stone, many people like to use points or towers simply because their shape lends itself to efficient transmission of energy. But regardless of shape, it's most important that you choose a stone that feels good to you and feels honoring of what you want to accomplish with your grid. Quartz is the most common stone on the planet, and because it is the most efficient crystal at storing and transmitting energy, it is often used in grids as both a center stone and as amplifying support stones. It's a powerful stone not to be underestimated due to its ease of accessibilty. For now, what if you just played with making a grid with whatever crystals you have on hand? And if you don't have enough crystals, what if it were as easy as plucking stones from the ground to use? How easy and loving can you make this process? After you've placed all your stones on your grid, you activate your intention and the energy of the collective by tracing the lines of the shape and passing over each crystal. We love our selenite wands for this portion of the ritual, but again, you can use whatever crystal you have on hand for now. A small quartz point or any other long skinny crystal will do the trick as well! The idea is that it is a focused channel of energy for connecting the energy of each member of the grid. And if you don't have a wand today, simply use your finger with purpose and love to trace your grid and connect your crystals. Don't forget to place your written intentions on a small piece of paper and place it under your center stone! This energetically binds you to the grid but is also a wonderful reminder of where you began when you finally dismantle your grid. So often we find ourselves in a moment of wanting or in crisis only to completely forget that pain point later. Writing down your intentions is such a cool marker to remind you of how powerful you actually are and how much magic is working in your life! And you can find a plethora of shops selling cloth grids on Etsy here. They typically run around $10-20. You'll also see many "crystal grid kits" for sale online. While these are wonderful for beginners, we often prefer to piece our grids together with stones we have handpicked. These themed kits are great resources however for research and guidance on which crystals align with which intentions. 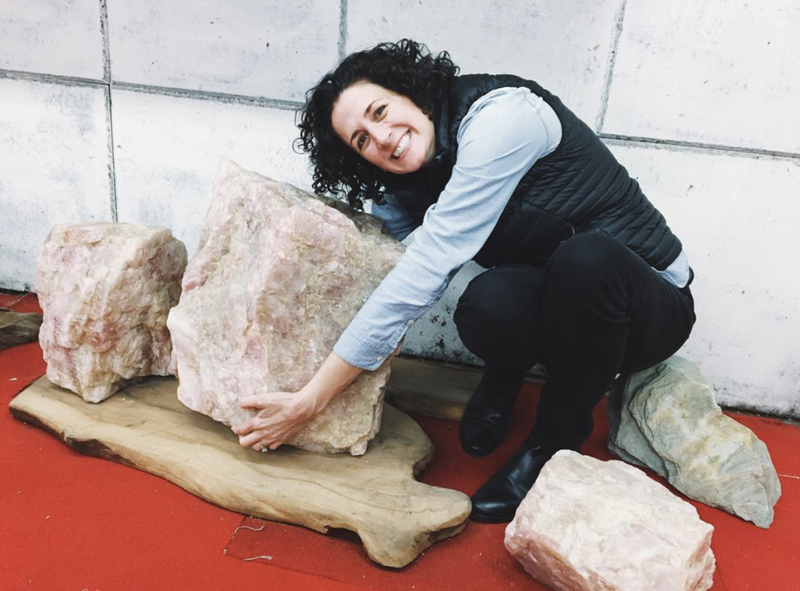 We LOVE shopping at local crystal shops and regional gem and mineral shows to source many of our crystals. There's nothing like getting to touch and feel a stone before you purchase. A quick google search of crystals will lead you to endless online retailers. Just be sure if you're buying a crystal that is only found and mined in one part of the world that you're actually buying what you think you are. This is why we usually stick to reputable retailers and Etsy shops where you can reach out to the sellers with questions before making a purchase. Remember, trust your own intuition in this process! We talk more about this in the video in Lesson 8, but it's so important to lean on your own relationship with your crystals when choosing which ones to populate your grid with. However, if you'd still like a little help knowing which stones to choose for your grid, here are some common crystals by intention used for gridding. And of course quartz is a great addition to any grid! Intention-setting is the crux of building a grid that actually works. You have to know what you want, and by god you have to mean it! So many of our grids have been inspired from moments of true longing and seeking of the Universe. It doesn't mean that all your grids have to come from a place of lack or confusion, but it does mean that the clearer you are on what you desire, the better the crystals will know how to do their jobs! What am I feeling separate from in my life currently? What perceived gaps would I like to close to bring me closer to the truth of myself? What do I want feel, experience, understand? What do I find myself constantly talking about in regards to my life? Career? Health? Relationships? Spirituality? Is there an area of my life where I would like to invite more clarity? Is there an area of my life where I could use some guidance? Wouldn't it be nice if...? Fill in the blank. Once you've decided on an intention for your grid, you can use the following meditation to imbue your center crystal with that energy. By now you are clear on what you desire and what job you want to assign to your crystals. Write that intention on a small piece of paper either in the form of a question or a stated desire. Be as clear and specific as you can. There could be an entire book written about this process alone! And yet at the same time, it's so supremely simple...go with your gut. Move from a place of intuition and inspiration. And ask your crystals which ones want to support you in this endeavor. Trust us, you'll know which ones are raising their hands and saying, "PICK ME! PICK ME!" See the next section for detailed information about cleansing crystals. Regarding your space and grid, a great cleansing tool is smudging with sage, palo santo or sweetgrass smoke. You simply light the smudge stick and then waft the smoke onto the grid, altar or room where you will build your crystal grid. This is traditionally done with a feather but can be done by simply waving the smudge stick as well. Sometimes cleaning a space is as simple as opening the windows and doors, letting in fresh air and light and asking out loud for any unwanted energies and entities to leave the area. You want to build your grid somewhere where it won't be disturbed - like an altar, a table or a bookshelf. If your grid has an intention specific to a particular space, consider putting it there. For instance, grids about work-related issues could be placed in your office. Grids about health or weight loss could be nestled in the kitchen somewhere safe. Looking at your grid commingles your energy and reinforces your intention. 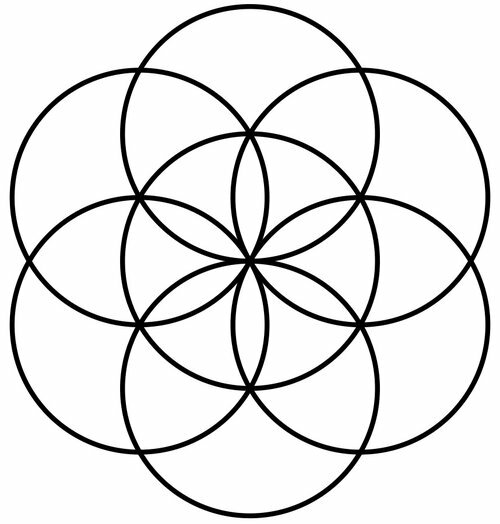 Simply place your folded up piece of paper at the center spot on your sacred geometry shape. If you like, you can use the meditation in the "Setting Intentions" section above to thoughtfully breathe your intentions into your center crystal. This can be as easy as holding the stone for a brief moment, closing your eyes, taking a deep breath and thinking about why you are building this grid. Once you are satisfied that your intention has been transferred to the stone, place it on top of the folded piece of paper with your written desires. Once the center stone is set, place a ring of stones just around it to support it in its job. We consider this ring of stones to be the helper stones and often pick stones with powers and meanings similar to that of the intention. Once you've placed the inner ring, form an outer ring of stones to help amplify the energy of the grid. These stones are the batteries of you grid, so we often pick high-vibing stones with great transmitting abilities. Quartz is a common crystal used in the outer ring of a grid. We like citrine and moldavite as well. The gridding process can be fast or slow, and it can include as much introspection and ceremony as you like. We often light candles, draw oracle cards, journal and meditate as part of this sacred time. The process itself is an act of prayer, but it's also nice at the end to bless the grid, offer thanks to the crystals and say any last words of intention. These are your energy warriors working on your behalf, so it never hurts to give them a little motivational speech before setting them off to do their important work. We love selenite wands for this process because they are known for bringing the light. Mindfully and purposefully trace the lines of your grid from the outside-in and the inside-out and then around the circles as well. This acts to connect the crystals. Again, this can take as much or as little time as you prefer. 11. GIVE THANKS AND LET IT WORK ITS MAGIC! Your grid is now activated! Give one last word of gratitude and then just bask in its beauty. We love taking photos of our grids to share with one another and to commemorate the intention. This is a personal choice and varies greatly from person to person and grid to grid. Some people let their grids sit for 40 days and 40 nights. Others choose a pre-determined amount of time related to their intention. For instance, if you have a deadline for a career goal or would like to hit a personal wellness benchmark by a certain date, you would leave the grid up for that amount of time. We often leave our grids up as long as we feel like we still need the support. You will know clearly and decisively when it is time to take down your grid. Crystals are ancient beings who have always lived in the same form. To us that's pretty miraculous and deserves respect. As we've learned how to better connect with our gem-helpers we have started to stray away from having crystals in one central location to favor having them all over the house with designated jobs. That said we both still have our own ways of keeping our gems organized, clean and happy. Lacy uses an old wooden printer's tray to let gems rest in who are not currently in use. This tray sits under her altar and gets pulled out weekly when she's setting intentions for the week in her sacred space. Kayla uses hand carved wooden bowls to nestle her crystal friends. Most of her bowls live in her bedroom near her altar space too. She organizes her bowls by crystal powers (protection, love, grounding, channeling, etc) and sometimes will set an entire bowl in a room or a windowsill to charge the space with that energy. While both of our altars are in our bedrooms we'd like to issue a word of caution about sleeping with too many crystals near your bed. These beings have powerful and varying energies. It can be too much for your energetic system to have too many of them close by. Keep that in mind as you create your altar space and play with finding the best location and storage method. The idea is to choose something that feels loving and fun. Are you sensing a theme here? We hope so. Over time your crystals will pick up energies and vibrations that will need to be cleansed. Cleansing stones is in itself an easy task. But we find that the real magic in the process is the intentionality behind simply doing it. By cleansing your stones at regular intervals, you are reminded to also care for and cleanse your body, your thoughts, and your home. Full/New Moon: Place stones outside or on a windowsill during a full or new moon. We often gather our stones and put them all on trays or several large cookie sheets for ease of transport outside. It doesn't matter if it's a cloudy night - the crystals will still receive the benefit of the moon's energetic pull. Mother Earth: Place gems into soil for 24 hours. This can be done outside in the earth or in the soil of your healthiest houseplant for 24 hours once a month. You may have a couple of plants that you rotate through. It's a wonderful way to clean your crystals especially if you forget to place them outside during the full moon. It's also a really handy trick for those who live in apartments or don't have a safe space to put your crystals outside. If you have signature jewelry pieces that you always wear you'll want to include those in the cleaning process too. Think of how much energy you carry with you every single day in those pieces. Personal Intention: Hold the stone while focusing on it. Repeat the following, "Universe (or Angles/ Guides) please cleanse this stone of all negative energies. Recharge it for it's maximum potential and for the highest good. Thank you for your support and assistance." Running Water: Hold your stone under clear, purified *water (do not use tap) for as long as needed. Practice feeling when your stone feels "lighter" and thoroughly cleansed. *Some stones are water soluble and should not be immersed. Your selenite wand should NOT be placed in water as it will initially go dull and then ultimately disintegrate. Sun: Our sun is alive and a powerful energetic cleanser. Leave stones in the sunlight to receive the sun's charge. Organic Brown Rice or Himalayan Salt: Place your stone in a bowl of rice or salt overnight. The rice/salt will absorb all the negative energies. Be sure to discard the rice/salt afterwards. Smudging: Burn sage, sweet grass, palo santo or sandalwood and pass the crystals through the smoke several times. This video is one to watch when you have time to get cozy and enjoy a good laugh. We share how we came to love building crystal grids and offer background on our own love affair with crystals. We also walk you through building a grid and offer advice for making the practice your own. If you've ever been on retreat with us, you'll feel right at home with our back-and-forth style of teaching which is chock-full of real-life stories and sister silliness. Below are a few products we mentioned in the video that are go-to resources for our work with crystals, intention-setting and meditation. This course is specifically about gridding with your crystals to connect with your desires and intentions. However, because we are both passionate water-loving gals, we wanted to include some of our other favorite ways to put your gems to work with the magic of the earth's waters. A word of caution! Although we believe all stones were placed in and on this earth for a reason, MANY stones are toxic to humans and animals. Though they have incredible qualities and are often safe to have in your collection for gridding or displaying in your home, it is best not to use them in your gem waters, baths, essences and elixirs. Specifically never use radioactive gems or crystals that contain mercury, lead, arsenic or aluminum. Anything quartz (rose quartz, smoky quartz, etc) are always safe crystals for waters, baths, elixirs and essences. In this video Kayla walks you through crystal bath preparation. For her this process includes crystals, bath salts, diffused oils, candles and malas for personal ritual. However, as is the rule of thumb with most of our teachings, make this process your own! We often run the bath extra hot and then place the stones in to infuse the water before actually getting in with them. Allow about 15-20 minutes for this process. The crystals will continue to charge once you are in the water as well. Magnesium, epsom and himalayan salts are a wonderful addition to the bath, as they will pull toxins from your body and help amplify the effect of the crystals. Once done with the bath (we recommend soaking at least 30 minutes), we usually thank our crystals, rinse them with fresh water and place them in the sun to recharge. For gem waters, you will be infusing water with the energy of the crystal. It's a subtle energy and a wonderful way to start working with crystals for healing. Water is highly programmable so in addition to the gem energy you'll be infusing your water with intention, love and gratitude. You may also set your water on top of your grid or on your altar to further charge it. This video teaches the indirect method for making drinking waters (think double boiler) that we prefer as it always guarantees safety. Place your stones in an empty glass or jar and cover the top with either a lid or cheese cloth. Then place the jar into a pitcher of pre-boiled or distilled water. Hold the pitcher and set an intention infusing the water and crystals with your energy. You may also write LOVE + GRATITUDE on a sticky note and place it on the side of the pitcher for extra good vibes. Place the pitcher in the sun or moonlight (indirect light is fine) for 2-4 hours to infuse the water with the crystal energy. Drink it same day to receive the energetic benefits. *This is a comprehensive list of stones with toxic elements in them. You'll see there are MANY stones on this list. This information is most helpful so that you can be sure to use the indirect method if you choose to use that stone to make a gem water. A nifty trick - do not use a crystal in a gem water that ends in the letters 'ite' as most are on the toxic list. The magic is in all of this is you. Your intention. Your desires. Your heart. The crystals are wonderful helpers (and we believe they are quite mystical), but at the end of the day it all comes down to you. If you believe in their power and treat the process with love and fun, you will feel the energetic sprays of joy and peace that they emit. We are big believers in following what feels good in your life. If you can follow your "feel-good" one little breadcrumb at a time, you will always find your way back to yourself. It is our deepest hope and our greatest intention that the guidance and support in this course reminds you of your inherent wholeness and the power you have to create. Joy is your birthright. May your crystals remind you to claim it.